From pro-Kim Il-Sung leftist to anti-Kim Jong-Il extreme right – Charges made by National Intelligence Service and Defense Security Command to suit their needs: In defense of human rights. December 24, 2004, but nothing has changed from December 24, 1999. They were like that also at that time on Christmas in 1999. Only the location was changed from Brussels to Seoul. On my way to Uljiro Entrance after dropping by at a Kyobo bookstore. Confirming not being able to be free from the oppression of National Intelligence Service (NIS) even on a day like today and raised voice about the cruel oppression by political power. I told the police in front of my eyes to contact NIS and take me. Around 4:30 pm on the way home, a jeep covered with clothes with Military Police written on it is driven in front of me from the side street in front of my home. Military Police car, as if a police car is not enough! The materials were organized on the internet on military attaché lieutenant colonel Seung-Sun Lee (Period of Second Oppression in Europe), who conspired with the errand men of political oppression ring that used even germs while falsely accusing me of being anti-government recently, and self-styled lieutenant colonel Yang-Hong Bae (Period of First Oppression in Europe) of DSC in whose presence even the stars are said to tremble, who participated in the conspiracy using drug. In the early period (1986 – 1987) after I went to Belgium, Jin who was referred to me by a short term student invited me to a dinner at his house. I found out later that agent Jin participated in the conspiracy at that time with Yang-Hong Bae etc. as organization colleague going beyond time and space with Gil-Sang Nho and Jeon Yeum. (When I checked on the internet after returning from Atlanta, he was in a city that was a few hours driving distance from Brussels where I was staying. Re-confirmed on Aug. 22, 2004.) I turned it down as I was occupied with examination, but he asked me to connect electricity, so I took an expensive taxi because I did not have time, and struggled to remember what I learned from an electrician when I was moving, and connected triple electric wires. In the middle of the conversation over the dinner, all of a sudden in front of a foreigner and his spouse, he accused me as one with political thoughts that should disappear. And the foreigner who was in front of me put his feet with only socks on the dinner table. With only a few words, agent Jin successfully packaged me as pro-Kim Il-Sung leftist. After it happened in Brussels, it was the beginning of everything. KCIA staff who was assigned at the Embassy at that time was found attempting to conspire with Song Pyung-Jun. After that, I received Shish kebab in the middle of the night from a KCIA (currently NIS) staff. (One agent smiled and intentionally said to me that the agent who sent me Shish Kebab immigrated to the U.S. For what reason did the person who had to hide his whereabouts intentionally allow notifying me where he was going? At that time, I was already addicted to their drug. At that time, I was not aware of their cruel intention. The agent who sent me shish kebab was one of the people who advertised me as someone that has to disappear). Just like a mafia who sends a gift of dead fish, like the Mr. and Mrs. Consul at the Embassy who recommended me to eat bean rice displaying bean rice and salted bean, that gift which was not a gift was a kind of threat that they make which is hard to notice. Yang-Hong Bae talked about his faith and even told me to give the bible that I was keeping as extra. Yang-Hong Bae is the core person even Gil-Sang Nho and Jeon Yeom knew. Of course I gave Bae, an officer of DSC, the extra bible that I purchased through a church. At first he was very polite and well mannered. He maintained that attitude for a while. He explained about his foreign language skills, and boasted that he came abroad to study about such military intelligence operation methods etc. that are very important in the military academy, listing such words as intelligence operation, political operation, and dissolution operation. To put it again, it was an explanation about how capable he was. DSC officer Bae mobilized people around him and delivered the news that his promotion is getting delayed, and Bae himself showed the anxious attitudes, and even complained about the insufficient funds for studying abroad. I maintained a relationship like neighbors sharing Ra Myon or the fruits that I brought. After such times passed, DSC officer Bae suddenly changed his attitudes and called me “a North Korean” and prepared a conspiracy to package me as pro-Kim Il-Sung communist. After that incident, he’s colleagues used drug. What he did was the operation that he said he was learning. Agent Jin who invited me to a dinner held at his house all of a sudden accused me, in front of a foreigner and his spouse, as person with political thoughts that should disappear. After that, agent Jin packaged me as a person with political thoughts that should disappear, and led me to naturally meet foreigners residing in Belgium including foreign soldiers and soldier’s families to show me as pro-Kim Il-Sung communist. (Military attaché of Embassy etc. who has the same purpose as Bae of DSC is related). A few planned publicity campaign. Their plan was not realized continuously because I didn’t have a car. 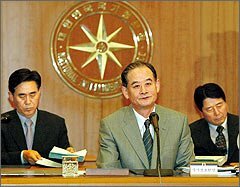 After Mr. Dae-Jung Kim was inaugurated as president, political oppression agents and diplomats appeared who were running errands for President Dae-Jung Kim who accused me to be anti-government, pro-Kim Jung-Il leftist and anti-Kim Jung-Il extreme right, and attempted to kidnap and murder. It was when President Kim Dae-Jung visited North Korea and received Nobel Prize talking about North-South reconciliation when the charge was changed to anti-Kim Jong-Il extreme right. The political oppression organization led by vice minister rank Ambassador Choi Dae-Hwa who accused me of being pro-Kim Jong Il leftist and anti-Kim Jong Il extreme right gave me an opportunity to choose the political thoughts of President Kim Dae-Jung after a numerous attempts to kidnap and assassinate and biological agent using terror. I rejected the political thoughts of President Kim Dae-Jung right on the spot. It was after a worship service. It was a political oppression organization including lieutenant colonel Lee Seung-Sun and Nho Gil-Sang. I had to leave Brussels in early 2001 abandoning everything, rejecting their dirty compensation with the condition attached that I should not return to Seoul. 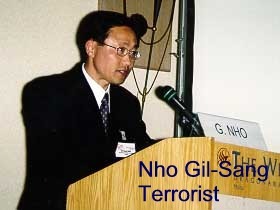 Nho Gil-Sang is a person who attempted to appease me in front of the Palais de Justice saying that the world is about who eats more, and he committed bioterrorism, and tried to threaten me by mentioning Interpol. Choi who said he was from DSC is the person who accused me of being anti-Kim Jung-Il extreme right. Choi tried to package me as extreme right mentioning the assassination of Kim Jong-Il at a restaurant that people frequented which is located between the radio and television tower and Square Montgomery. While saying something to that effect, he mentioned the name Lee Chul-Seung that I was not aware of. This was the moment of re-packaging me as anti-Kim Jong-Il extreme right, while I was accused of being pro-Kim Il-Song leftist in college because I talked about democracy. It is a word game for the purpose of making charges by DSC and NIS. Are charges made up through word game? They were. After Mayor Lee Myung-bak’s inauguration event was over, I was taking a short rest at a coffee shop next to the location where Patty Kim was singing for the inauguration event, and people were gathering to my side one by one. They were talking loudly, why conservatism in this age, as if they wanted me to hear. What are they saying these words for? Their words were the words that explained today’s situation well. Presidential Election day 2002 An errand man delivers a word in the side street next to the voting place, make a good choice this time, the act reminded me of suggesting and forcing me to accommodate the political thoughts of President Kim Dae-Jung in the face of death. Is it democracy to force the selection of Presidential candidate Roh Moo-hyun on a Presidential election date? Will it suffice to kill by means of biochemical terror through accusing leftist and extreme right? If one rejects the political thoughts of President Dae-Jung Kim, is the human rights of the person who rejected not the human rights? A person who became a councilor, who uses a word patriot to describe himself, who threatened me for the errand men of President Dae-Jung Kim, said when his identity was revealed and he was in the corner, “it was for survival”! He said that he is a person who makes anti-government political criminal and participates in political oppression for survival. This man cannot be considered financially poor. Is this democracy that we shouted for during college, where human rights are guaranteed, for which many people hoped for! The errand men of political violence have the same purpose since agent Jin. They attempt kidnapping and assassination and use germ and chemicals as if drug does not suffice. There has been no change in the behaviors of the errand men for political violence up to today of NIS Director Ko Young-Koo.